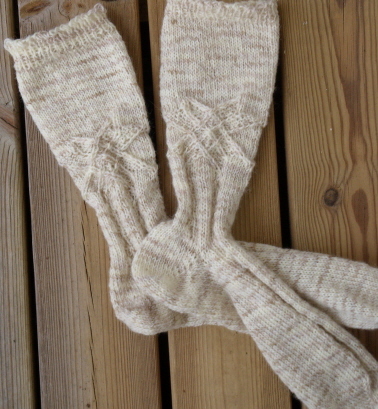 In the beginning of 1980 I knitted knee-high socks from a pattern from Estonia. Now I have no pattern and I think the socks are great so I have tried to make a new pattern, this time from toe up. Sock yarn, In Regia, Opal, Trekking or something else. I made mine in Trekking. Cast on 20 stitches on two needles as shown on the pictures. 10 stitches on each needle. Start as you are used to for a long tail cast on but see to that the yarn ball is on the other side than you are used to. 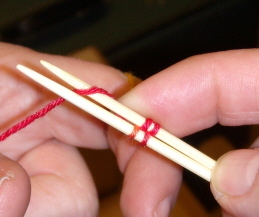 On these needles there are 9 stitches see to that you cast on 10 on each side. 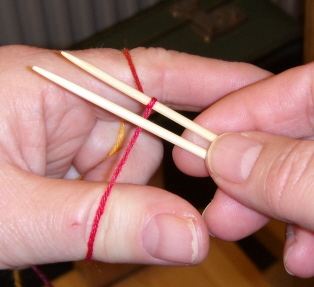 Start knitting and divide the stitches on four needles. The first needles knit as normal. The other side knit in the back loops. Next row is an increase row as every other row. Increase every other row until there is 16 stitches on every needle. Total 64. 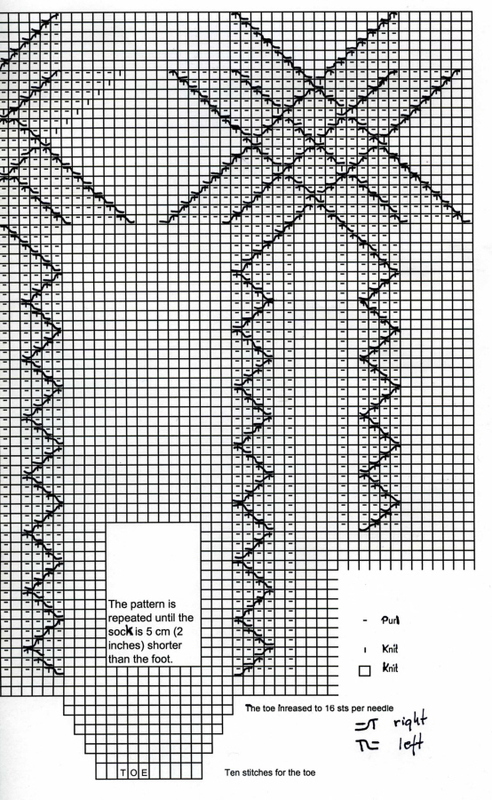 Knit 3 rows without increases. 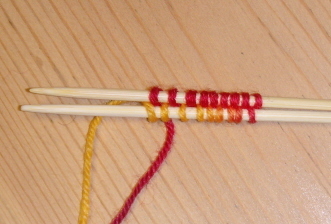 The symbols means to tell to let a knitted stitch travel from left to right on a purl background and from right to left on a purled background. Slip two stitches from the left needle to the right needle and lift the second stitch in front of the first stitch as you are changing their places. 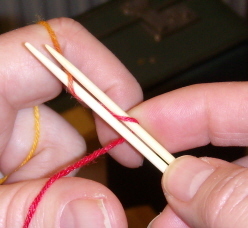 Put them back on the left needle and knit one purl one. (This part is quite difficult to explain) The result is a stitch leaning to the right. Slip two stitches to the right needle and lift the second stitch behind the first stitch on the left needle, put the stitches back on the left needle and purl one, knit one. The result is one stitch leaning to the left. 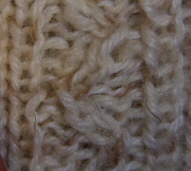 The pattern is over 4 stitches so the knitted stitch travels over 3 purled stitches as you can se in the picture below. 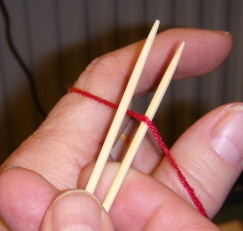 Needle 1: Knit 2, purl 1, knit 1, purl 2 and switch places between the two next stitches as described and knit 1, purl 1. (the stitch is leaning to the right). Knit 8 stitches. Needle 2: Knit 8 stitches, change places between the two next stitches and purl 1, knit 1, purl 2, knit 1, purl 1, knit 2. Needle 3 and 4: Knit all the stitches. Follow the chart and knit the sock until it is 2 inches (5 cm) shorter than it will be with the heel. 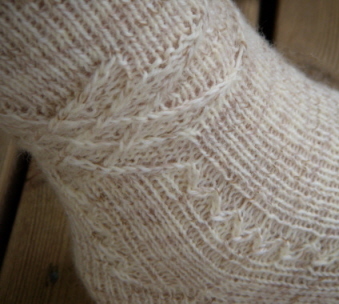 The heel is knitted on needle 3 and 4. Row 1: Knit 31 stitches, move the yarn as if to purl, slip the last unworked stitch from left needle to the right needle and turn the work. Row 2: Slip the first stitch from the left needle to the right needle. Purl the next stitches to the last stitch on the other side of the heel. Move the yarn as to knit and slip the last stitch, turn. Row 3: Slip the first stitch and knit across to the last stitch before the unworked stitch, wrap and turn. Row 4: Slip the first stitch and purl across to the stitch before the unworked stitch, wrap and turn. Repeat rows 3 and 4 until the heel is 10 unwrapped stitches in the middle. Row 1: Knit across the 10 stitches to the first unworked, wrapped stitch. To work this stitch, pick up the wrap and knit it together with the stitch. 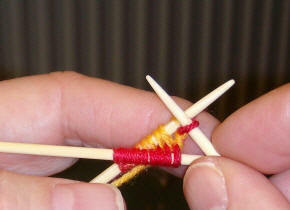 On the following rows you will pick up both wraps and knit or purl them together with the stitch. Continue until you have worked all the stitches and you once again have 32stitches. Knit 4 rows after the heel. 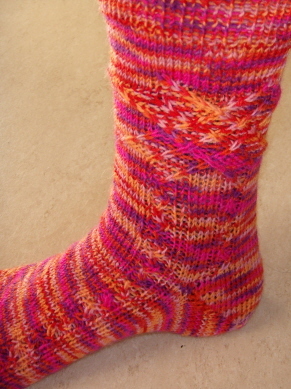 Start the pattern over the heel and see to that it will be symmetrical with the pattern on the front of the sock. Otherwise it will be hard to make the star pattern later on. Follow the chart or make some more rows before the star pattern. After the pattern knit as long leg as you want to and end with knit 1 purl 1 for 2 inches (5 cm). Do not make it too short.